For centuries, humanity has been symbolically relating the shifting seasons with change. Seasons have always been used as a metaphorical depiction of the correlation between life and death, light and darkness, good and bad. Each transition between the four stages of climate change requires a cleanse of all things unhealthy and unworthy of our time. Marking the most drastic changes of them all, Spring signifies the metaphorical transition between life and death and as such, it requires the purest base for the establishment of a new existence, free of any burdens and hardships. In art, Spring is depicted as a clean canvas through which the creator can unleash his ingenuity and develop his artistry to the maximum. History knows many ways in which visionaries managed to purge their minds and souls in order to accept a new avocation of their creativeness. In modern days, clearing up our minds and preparing them for a new beginning is a rather simpler task. A quick workspace cleanup can often do miracles in terms of giving us that clean slate for creativity that we’ve been craving for. In modern days, clearing up our minds and preparing them for a new beginning is a rather simpler task. A quick workspace cleanup can often do miracles in terms of giving us that clean slate for creativity that we’ve been craving for. Put on your cleaning gloves and get to work because things are about to get messy! Conducting a deep spring clean of your digital workspace might seem easy to the naked eye. Yet, upon closer inspection, it turns out to be a difficult undertaking. 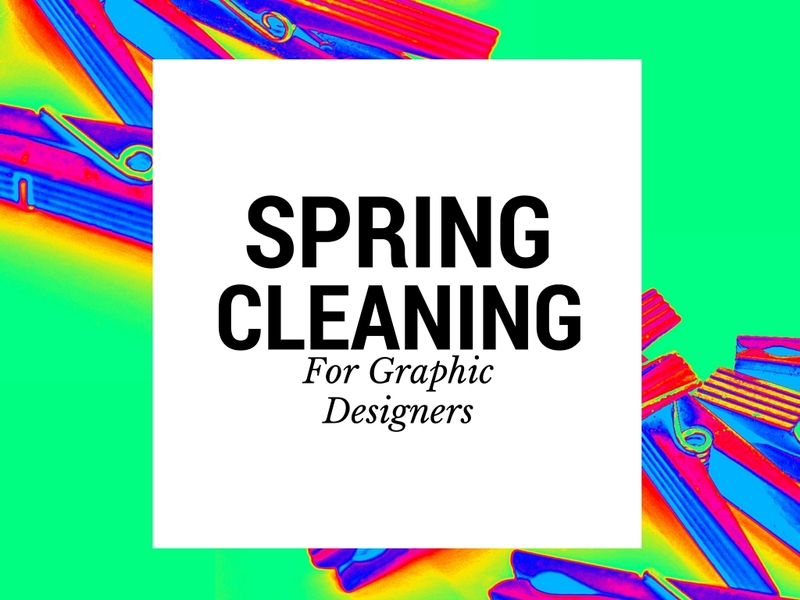 In order to start off a new page of your design career and reach higher peaks, you need to cleanse your work area ( and your mind ) of the clutter that has been accumulating for the past year. Design is all about idea generation and inventiveness, yet, too much information and resources can often clog up your pipes and stop the creativity flow. Creating the perfect design element for your next project is a tiresome activity that requires lots of time and dedication. Unlike designing, the hunt for ready-made graphic art proves to be rather easier, quicker and sometimes, significantly more pleasant. It’s like a treasure hunt where each pebble is a precious stone waiting to be polished. Enchanted by the simplicity of using free design resources and templates to build on, most of us end up overflowing our hard drives with design resources we hardly ever use. If you’re scared to open that old resources folder, then it’s maybe time clean things up. Royalty-free photography, vector ornaments and clip art of all kinds can be a burden as much as they can be a blessing. And as it often turns out, letting go of something old brings new, better things into our lives. If you feel that your mind is cluttered and your computer is slowed down or running low on space, it’s maybe time to have a well-deserved clean up and what’s a better time for this than Spring? It’s really not that hard. In fact, all you got to do is systematise your design resources by following the three pillars of design: category, usability and style. Does this file serve any purpose to you? In which design category do you feel it would fit? Does its appearance match your ideas of style? Ask yourself these questions and you’ll be able to decisively dust off your old design resources and de-clutter your folders to open new space for better ideas and experiences that will make your clients fall in love with your work all over again. Here are my top five tips for keeping a clean workspace and steady design workflow. Get an external hard drive or even better – make a subscription for premium cloud storage services. Make sure you always keep a flash drive with you when head off to client meetings. Sometimes clients prefer to transfer files the old-school way. Always toss away your newly downloaded files to a Temp folder. If you find yourself using those files rather frequently, categorise аnd allocate them to a different folder. Liked how your last project turned out but your client wasn’t that happy with the results? Add it to your extended portfolio and transfer the work files to a cloud storage. A photo takes you too much time to find? Lose its original name and rename it to something more meaningful to you. If you wish to find its true name, just upload it in Google Images and watch the miracle happen.